If there’s anything we’ve learned the first two games of the first-round series between the Boston Bruins and Toronto Maple Leafs, it’s that the Bruins are still, very much, the Bruins of old. Now, obviously, they can’t exactly replicate the Big Bad Bruins of the 1970s in the modern National Hockey League. But the team that bullied their way to a Stanley Cup in 2011, though substantially turned over – only five skaters remain from that championship team, has left an indelible mark on the franchise, providing a blueprint for winning, Boston-style, in the new NHL. Unfortunately for the Leafs, they’ve bought into the Bruins’ game, focussing their efforts on responding to – even one-upping – Boston’s needling and physicality, while almost completely disregarding their own identity in the process. The Bruins were eighth in the NHL during the regular season in hits, with 1,914, or 23.3 per game. The Leafs, meanwhile, were 26th, with 1,632, or 19.9 per game. The Bruins were the seventh-most penalised team, averaging 9 minutes and 29 seconds of penalty time per game. The Leafs, meanwhile, were a distant 28th, at 6:57 per game. In terms of penalty type, the Bruins were fourth in majors with 28, well over double the 26th-ranked Leafs, who only had 12. It’s the same story when breaking down minor penalties. If you look at the most aggressive infractions – for the purposes of this article, cross-checking, roughing and slashing, Toronto (sixth) was penalised more for cross-checking than the Bruins (26th), with 18 minors to Boston’s eight, but took far fewer roughing (17; 27th) and slashing (27; 28th) penalties than did the Bruins, who took 32 (sixth) and 49 (fourth), respectively. Clearly then, the Bruins are much-more aggressive team than the Leafs. They’re also much better at getting away with it. In the 2011 Stanley Cup Final, the Bruins were unquestionably the inferior team on paper (and with regards to on-ice product, frankly), but were able to leverage their hive-mindedness to play a punishing, pestilent style that got under the skin of the Vancouver Canucks. Due to a combination of injury, suspension and the Bruins’ expert manipulation of NHL officials, the Canucks lost the plot and abandoned their game plan for sustained stretches, attempting – unsuccessfully – to out-Bruin the Bruins, instead of sticking to what made them so good in the first place. It got worse, too; after the loss, the Canucks began to psychotically pick away at a team with which nothing was wrong, leading to the British Columbian tire fire we know and love today. And all because they allowed the Bruins to dictate the terms of play. As mentioned, the Bruins only carry five skaters on their current roster (plus Tuukka Rask) who were on that 2011 team. However, when one factors in who said players are, the reason Boston still plays the same way becomes much, much clearer. Brad Marchand, David Krejci, Patrice Bergeron and Zdeno Chara are all tremendously skilled hockey players with the ability to annoy the opposition and make them pay on both sides of the scoresheet. Adam McQuaid, though no offensive dynamo, is as punishing a defenseman as they come. All were central characters in the 2011 win, and are joined in 2018 by the likes of David Backes – a surrogate for Milan Lucic if there ever was one – and others of similar disposition. Moreover, this lethal combination of skill and ill-humour is tempered by the aforementioned playoff experience of the Bruins. The Bostonians are well-versed in massaging the generous officiating standards of the NHL playoffs, pushing things riiight up to the line. Sometimes, they cross that line but, even if they do, more often than not, they take one or more opponents down with them. 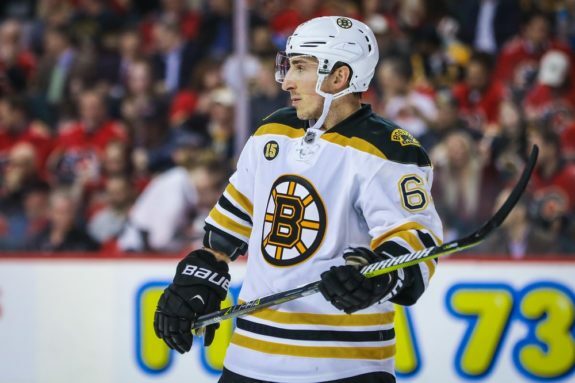 Even when they don’t cross the line – and or when their antics are not in full view of the officials, the Bruins often solicit retaliation from opponents which, as anyone who has played hockey will tell you, is something rarely missed by referees. And if Boston ends up the only team penalised? No problem! 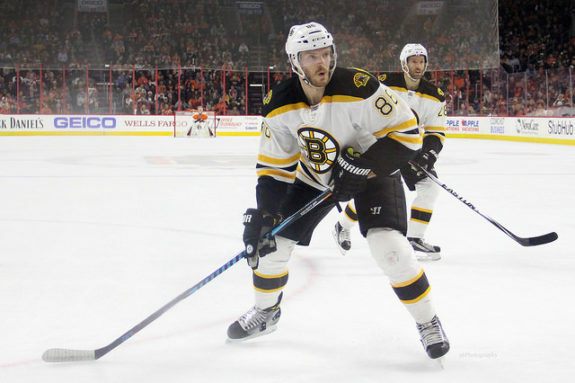 The Bruins had the NHL’s third-ranked penalty kill during the regular season, at 83.7 percent – with nine shorthanded goals (fourth-best), to boot. As such, the team toughness and truculence of the Bruins presents a formidable challenge for the Leafs. And you know what the exact wrong thing to do is? Getting sucked into it. Unfortunately for Toronto, it appears their strategy – whether planned or spurred on by the heat of the moment – is to give as good as they get. Needless to say, it hasn’t worked, and the Leafs return home to Toronto down 2-0 in the series. If you’re searching for specific examples, look no further than Nazem Kadri, who took two runs at Tommy Wingels in the third period of Game 1, the second of which, in response to a questionable hit on Mitch Marner, resulted in a five-minute major (on which the Bruins scored), a game misconduct and a well-earned three-game suspension. Or, in Game 2, there was Ron Hainsey who, also responding to a borderline hit on Marner, dropped the gloves in an attempt to fight Tim Schaller, gifting the Bruins another power play on which they capitalised. Two games, two key pieces of the Leafs’ roster – Kadri, a 30-goal two-way centre, and Hainsey, a top-pairing defenseman who also plays the penalty kill – took themselves out of the game (in Kadri’s case, several games) in response to the provocations of a couple of Boston role players. On a more general note, through two non-overtime games in the playoffs, the Leafs are nearly dead-even with the Bruins in hits (70, to Boston’s 71). Clearly, the Leafs are responding to Boston’s physicality, and doing their darndest to keep up. But why? What reason is there for Toronto to throw 35 hits per game – almost double their regular-season average? Why are the Leafs chasing the Bruins around the ice, deviating from what made them so successful? Look, the Leafs need to make peace with the fact the Bruins play the way they play and, this being the NHL, they aren’t always going to be called on it. But what should Toronto do instead of responding? Exactly what earned them the sixth-highest point total in the league: Use their speed and skill to their advantage, making the most of one of the NHL’s most balanced attacks. Look at Toronto’s only goal in Game 1: Zach Hyman, by no measure the Leafs’ fastest skater, burned two Bruins on his way to a breakaway goal. Kasperi Kapanen did the same in Game 2, hitting the post after giving himself a clear breakaway. In terms of Toronto shots in Game 2 that did find the back of the net, Marner potted a goal off a three-on-one rush manufactured entirely by the Leafs’ speed, and Tyler Bozak’s tally was the result of the Leafs skating circles around the Bruins in the Boston end. If Toronto is going to have any chance in this series, they’ve got to calmly endure the Boston punishment and take the game to the Bruins. Yes, they won’t always get a call, but they’ll get their fair share; after all, no referee wants to be shown up. Yes, the Bruins have an excellent penalty kill, but the Leafs should at least make them work for it. And yes, Rask has been excellent so far, but they’ve solved him before – particularly this season. The Leafs had better figure it out and stop taking the bait. Otherwise, it’ll be a very short spring for the boys in blue and white.